I am definitely guilty of wearing my sloppiest, most tattered tees and yoga pants to the gym, but I recently discovered this brand Espalier Sport who's fierce workout gear gives a whole new motivation for working out! The color-blocking on their bra tops and leggings are the ultimate pieces to keep you chic while you sweat, not to mention the most comfortable fit and materials! It feels like just yesterday we were running around in sandals and little summer dresses, but thankfully the time has finally come to bundle up and kick off the holiday season! Some dread it, some live for it, but whichever camp you're in you can't avoid the fact that you have to start the gift hunt. Below is my gift round-up, covering multiple bases with budget friendly steals under $50 to splurge-worthy lust list gift guide, all featuring some really amazing items at high and low price points. Whether this christmas shopping guide helps you knock a few items off of your list for your friends and family, or gives you some ideas for yourself ;) - take a peak below to see my blogger Christmas picks! With festival season approaching, I am getting inspired to incorporate concert-ready looks into everyday outfit choices. Here are a couple of my picks for looks I'm into this spring. The first one is all about neutrals featuring pieces in cream, white, and black. I love this fringey, textured midi skirt by Sea New York, and while the obvious choice is to pair a high waisted skirt with a cropped top, I sometimes like to go the alternate route and pair long with something else oversized. In this case it is a T-shirt tunic, which also makes the look a bit more casual. For night time, or if you're feelin a bit "fancier" I would go with a structured bralette or short button down top. I always love me a button-down dress, be it long or short, and this little Band of Outsiders number is no exception. The print is awesome, and the silhouette is unique as well. Keep it daytime-casual with neutral slip on sneakers and a minimal leather bag. Some delicate yet interesting earrings are the perfect touch of cool details, as are these amazing Celine sunglasses in one of my all time favorite colors- mustard! As rumors are stirring that these frigid temperatures will soon slowly begin to rise, I'm am finally daring to think about spring attire! I'm thinking, as shown in the looks above, lots of short, loose dresses, whether they be of the t-shirt or collared variety, paired with platforms, flatforms, and streamlined gladiator sandals. Like most people (should be), I'm having a major obsession with fringe at the moment. I'll take it in any form- shirts, skirts, dresses, bags- I love it all! As for accessories, I'm loving simple crossbodies and minimal bucket bags. Now can we just have the weather to go with all of it? 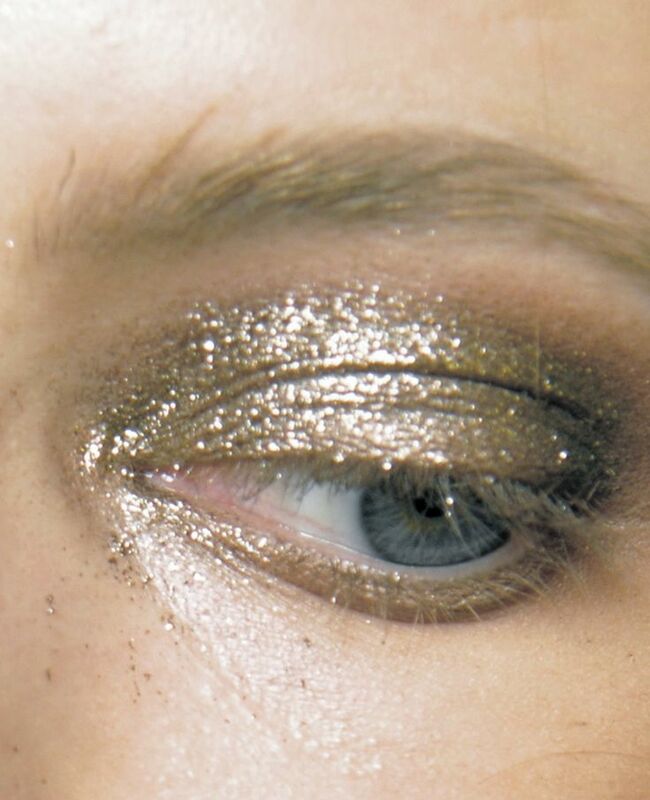 You may or may not be aware of my great love of Pinning, but here are a few inspiration photos I've gathered of the metallic eye trend I've been really into lately. 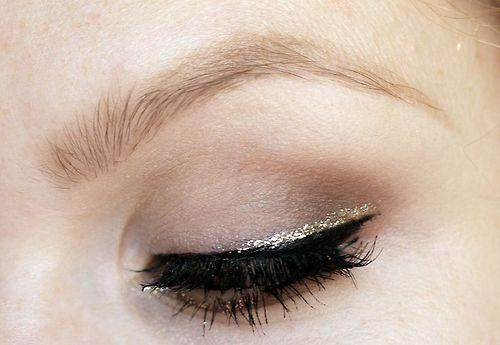 Whether it is an all-over smudge of the stuff, or just a simple, sharp line in a shiny bronze, silver, or gold, I think it is an interesting alternative to our usual browns and blacks. I definitely plan on testing this out in the near future! It was largely due to photos like these from my 'Hair and Beauty' board on Pinterest that I stood in front of my bathroom mirror a couple of months ago and chopped off my hair into its current above-shoulders length. I haven't had my hair this short since elementary school, but I must say that so far I am loving it! Enjoy some of these hair inspo shots of incredibly cool looking humans, and feel free to check out the rest of my beauty board here.